O: diad. 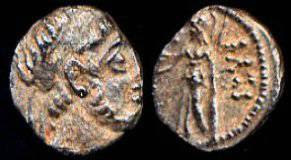 hd of Antiochus IX r. with short curly beard, diadem ends falling straight behind, dotted border. R: BAΣI reading downward on r., [AN ΦI] reading upward on l. (off flan). Athena stg., l., holding Nike and resting hand on shield, spear behind, dotted border.